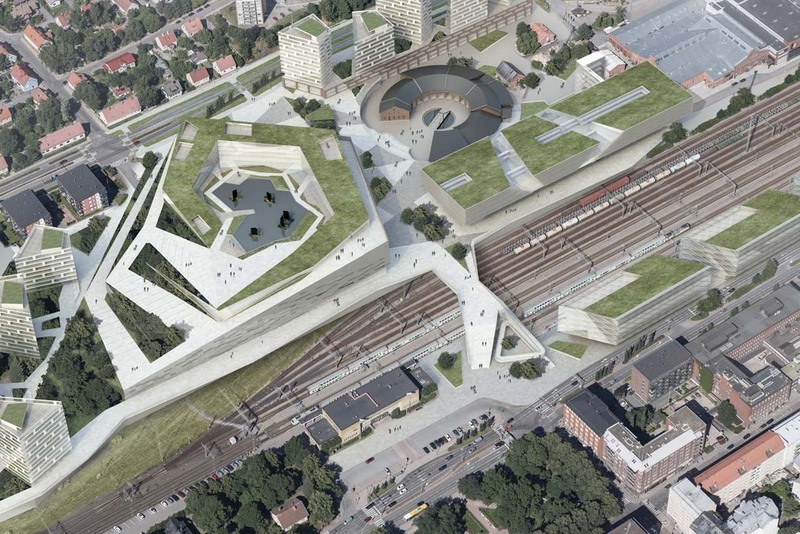 Helsinki-based PES-Architects' proposal Luoto (islet, skerry) has won the invited competition for a comprehensive plan to develop the railyard area in the city of Turku, Finland. The jury decision was unanimous. The railyard area is set to be an urban cluster of tourism, concerts, culture, music, experiences and sports, as well as everyday services, work, and housing. A total of 170,000 square metres of floor space will be constructed in the area between Turku Railway Station and the Logomo cultural centre. The area covers 13.2 hectares and is planned to house around 1,500 new residents. PES-Architect’s plan will introduce a dynamic expansion to the lively centre of Turku and offer residents an environment for good everyday life as well as enriching experiences. It will also provide ambitious opportunities for growth for the city. The focal point of the design is a central "hill" housing a multipurpose arena and hotel. This building will be a landmark for the area and serve as the platform for round-the-clock activities throughout the year. Visitors can ascend along scenic terraces to the rooftop to enjoy a variety of services as well as views opening over the city. The topography of the terraces is formed by the right-angled geometry of the sports facilities below the decks. According to the jury, the proposal retains a spacious and airy feel despite its massiveness. The plan does not reveal everything at once, but activates people to explore and browse the area. Several naturally emerging and exciting meeting places are created within the area, enabling encounters between people from different fields and sparking synergies and innovation. As the next step, PES-Architects will start to develop the plan further together with the representatives of the Turku Railyard project and the City of Turku. The goal is that the Experience Centre would be completed in 2022. The architecture competition was organised by the mainly privately funded Turun Ratapihan Kehitys Oy in cooperation with the City of Turku and VR Group. Five Finnish architectural practices were invited to participate.